You could say baseball has struck out as America's favorite pastime, because Americans would apparently rather watch TV than head to the ballpark. Nearly 80 percent of people living in the United States are watching TV on any given day. Television viewing swallows up more than half of all the time Americans spend on sports and leisure activities, according to data from the BLS's American Time Use Survey. 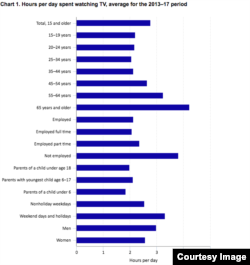 Older people and the unemployed watch the most TV, while parents with small children watch the least. Older people and the unemployed spent the most time watching TV. Americans over the age of 65 are the nation's biggest couch potatoes. They spend the most time — 4 and a half hours per day — in front of the tube. TV watching also varies by geography. 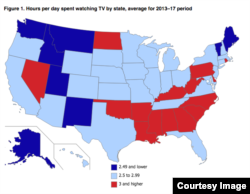 Residents in the American South are among the nation's most ardent TV viewers. People living in several of the Rocky Mountain states and in the Northeast tend to watch the least.